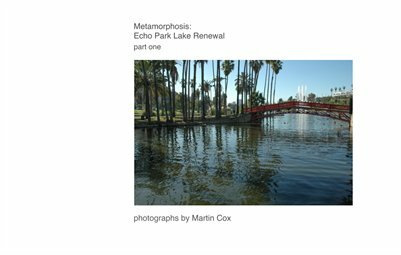 The story of a local lake - a book of photographs showing Echo Park Lake, Los Angeles as it was and how a massive lake renewal project progressed. From historic but blighted oasis through its closure after the last lotus festival and gradual draining revealing an unseen side. Part one ends with a dry lake, part two will cover the massive reconstruction and completion as state of the art eco park for a new century of recreation, wildlife and water treatment.